Photograph This! : What's cooler than being cool? Ice cold. I had to shoot clear glass and I wanted to make a dynamic image with a lot of punch. I am quite pleased with the outcome. So here is how I did it. First of all his is actually a composite of four different shots using the same glass, but each glass was shot in the same way. The background is a large light box lit with two Profoto heads. The glass is lit with a top strip light softbox. The table top is is white, with a glass sheet on top. However, the glass comes off from the back edge of the table and that's were the highball glass sits. Makes sense? You get the cool reflection at the front, but the bottom of the glass is partially illuminated by the back light and the table edge, being transparent is barely visible and easily disguised with Photoshop. The ice cubes ..they are plastic fakes, but look super cool and it'd be much harder to do the shot with real ice, as it would melt quickly and ... float. The drink in the glass is just water with some corn syrup, to give it the surface tension of say, vodka (this is an important detail, do not overlook this). 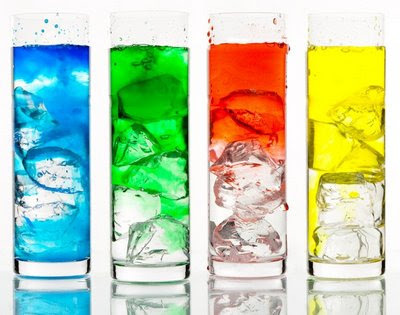 The colored stuff is just diluted food dye. However, getting the cool patterns as the dye drops in the glass was not easy. I used a small syringe to drop the dye from a few inches above the glass. First I diluted the dye into water and that did not work. The dye would just form a layer at the top without actually mixing. Not cool. The trick was to dilute the dye not in water but in mostly pure corn syrup, which is much denser and heavier. Once dropped into the highball glass it'd sink creating a wake of cool ripples. Expose with the background almost a pure white (but not overblown) and the glasses a couple of stops darker. Minor Photoshop post processing, mostly retouching and increased the contrast in the shadows a tad. Shot at ISO 100 f22, 1/125th, power pack with equal power for the background and the strip light, so about 800wsec total. The Profoto heads were great and having a fast recycle time crucial to get several images every time I dropped the dye. If you are doing this at home and have less power just open up a couple of stops and you should be fine.